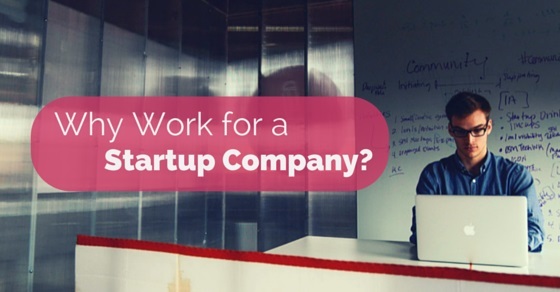 Why you Should work for a Startup Company? The competition among the big brands has elevated and a number of new small startups have popped in. Working in startup companies are exciting and offer a number of opportunities for fresh graduates. Though startups have their own risks, they offer you incredible experiences which would help you climb great heights in career. They are the best source which teaches you life lessons required for a successful career. The responsibility and knowledge can be expanded by working for a startup company. There are a number of pros as well as cons when one opts for a startup company and let’s take a look at a few of the reasons on why work for a startup. Why work for a Startup Over a Corporate Job? The following mentioned are few reasons on why work for a startup company. When you’ve opted to work for a startup company, they have their own method and culture. Here employees are found to work towards a specific goal and possess perfect awareness. They are free to wear their own dress code they are comfortable with and they work with excitement and equal work load. They also have the opportunity to work from home depending on the company and more freedom. When you have marched into a startup company, it is your own obligation to shape your own career. When you are fresh employee, you have the liberty to get around and know your coworkers and also get accustomed into project which you find fascinating. There may be minimized meetings and funding in the company but they look forward for an unceasing growth from the employees. The employees can be asked to complete a big list of errands which makes them feel they lie outside their comfort level. The learning curve in a startup company can be challenging but also attention-grabbing. But remember that in a startup company even a small achievement is greatly valuable. Being a part of startup companies helps offers you more opportunities to be creative and work hard. Startup companies are places where you can play integral role in developing a product. Startup companies are ones which boosts you and enable you to get ready for future projects. It would definitely be a gratifying experience when you’re able to develop something in any company and grab the attention of people around. A sense of ownership and extreme pride would be experienced when you have developed something new which is used by a number of people. Such excellent feelings cannot be possible in other working atmospheres and hence startup company help you develop from the beginning stage. Though there are few cons there are also number of advantages in a startup company, the main advantage would be that the employees gain a faultless work experience. The usual routine in big companies is that they welcome new employees and allow them to settle down and get to their niche. A startup company has less time for this process and permits new employees to work the running process. It is believed that one year in a startup company is equal to working in a big company for seven years. This is because the startup employees face the same workload, excitement, and force as expert employees in larger companies. So, startup companies are best place which can fetch you the best experience in career. As discussed, there may be number of advantages in a startup company, but remember there are also risks involved while working for a startup company. There are no picture-perfect levels of bureaucracy when you take into account startup companies. Decisions are to be taken by the individual on his or her own depending upon the circumstances in the company. With startup companies which are prone to less bureaucracy and red tape, it is the sole responsibility of the employee to take decisions and work for the specific goal of the company. The best reward a startup can offer is that, they are a great place to start your career and advance more. Getting initiated and elevating in your career can be well accomplished with startup companies. There are no specific terms and conditions for promotion when startups are considered. Promotions which help them advance their career life are accomplished when employees open up a strong performance in their job roles. The employees here also possess the freedom to discourse anything with the management people. The management also makes it important to discuss what the employees need and where they need to improve. The best part about working in a startup company is visibility, which stands to be a basic entity for developing excellent work environment. Visibility allows space for trust amongst the investors, customers, and also within the employees. Startups make sure to offer visibility in every nook and corner of business. Lack of bureaucracy and strong culture are other main aspects which enhances visibility. Startups are considered to be place to learn and gain knowledge from various innovators. Innovation is something that is being accomplished by many master pieces. The ground stage of startups offers you opportunities to work along with innovative people, creators, and other genius in the company. Learning about various levels of technology can be well achieved in startup companies. In a startup company every small thing you do, donates to the victory and failure of the company. Here you do not get the opportunity to get surrounded by safe blanket and carry on with mechanic work. Startups push you and make you creative, they permit you to think beyond boundaries. You should work for a startup company because, you do real work there. With the numerous advantages, there are certain disadvantages also in startup companies. In startups you need to perform other responsibilities too which do not fall to your list. If your co-workers are away you would be forced to complete their work. But remember that wearing many hats can fetch you knowledge and would be exciting too. Certain people think it would be nerve wrecking and get irritated. The other major disadvantage when a startup company is taken into account is that you would be paid less as the cash inflow would be less. Usually startups contribute its revenues to product development and business rather than bonuses or salaries. In cases where funding is slow and revenues are delayed, salaries will also be postponed. Working hours for most startups would be prolonged and sometimes employees would be asked to work at weekends too. These long working hours are also a disadvantage in startup companies. With the tight budget and less cash flow, the startup companies would have less machinery other resources required for production. For the same reason, startups usually complete their process by patching up with the old one. The risk in a startup company is that not all companies survive and win the race. Any startup company can fail within few years of initiation and push the employee to hunt for another job. Any startup company would work on budget basis, but it is also important to notice that future monetary opportunities are possible with startup companies. Chances for enhancement of salary are possible with startup companies. When you prove yourself skilled and use your talent and knowledge towards work, remember that you would be rewarded with the best salary more effective than corporate workers. The main risk involved in a startup company is that you’re likely recruited and thrown into work which shows you more of workload and pressure. Corporates recruit employees and offer them adequate training so that they get used and handle the work pressure. Since they are small workforce which has a greater mission, every factor adds to the company’s growth. By working in a startup you can learn to handle many processes and be your own boss. Startups would be offering you opportunities and more knowledge to handle your own company. Startups teach you to execute strategies, set goals and also make your product a highlighted one in the market with many business operations. So it would be good not to underestimate about startup companies and also not to hesitate to work in startups. Startup companies are ones which is not meant for everyone. There are many advantages which seem to be disadvantage for others and many disadvantages which look as advantages for others. It is important for employees and fresh graduates to evaluate and choose the right fit for their future. There are many startups that have failed but in the same manner, you should also make a point that it would be successful one day. If there are startups which have failed, then make sure that you would walk out with excellent experience. There are number of hands on tools, knowledge, experience, skills and responsibilities that startup companies offer you.